Stay cool during the summer and warm in the winter when you contract with Ronnie on the Spot, LLC, of Lathrop, California. 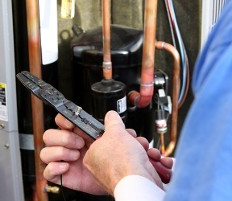 We offer HVAC repair and maintenance for electric and gas, up to the sealed system at affordable rates. At Ronnie on the Spot, we have a reputation for honest work, which is why we would never recommend a service you don’t need. Before any service is performed, we troubleshoot the problem area to determine the extent of work needed to fix the problem with your unit. For your convenience, you may schedule yearly or bi-yearly inspections to maintain the upkeep of your system. Prolong the life of your furnace and save money in the long-term with help from our company. Our Service Specialist changes all the air filters, inspect each component, and clean the necessary areas of the furnace to increase airflow, making your furnace move air more efficiently and saving you money in heating expenses. Keep your system running efficiently with HVAC repair and maintenance from Ronnie on the Spot, LLC.